Here in Part-II, I will enhance the understanding of the causal effect between (charged particles) cosmic rays associated with a) geo-physical i.e. earthquakes, volcanoes, hurricanes, tornadoes etc. 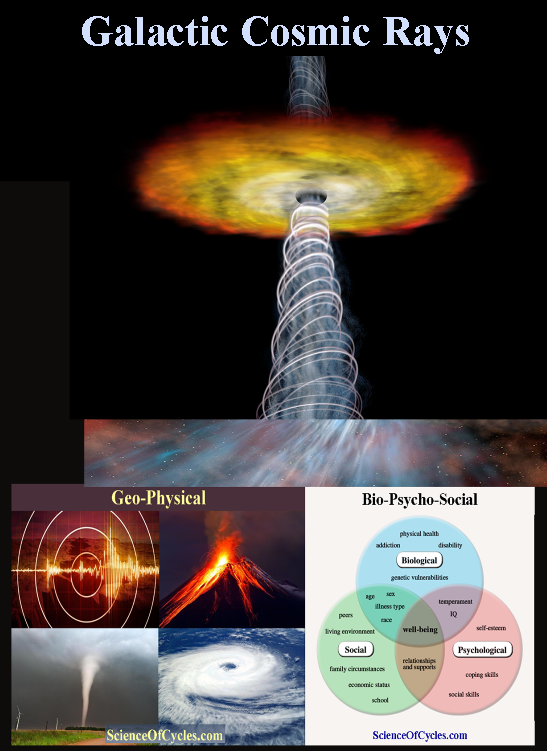 and b) bio-psycho-social i.e. depression, disorientation, anxiety, and depression turned inward ‘rage’. My research suggests during the period eclipse transition, which I surmise to have a process of expansion and contraction prior to and after its apex. In this case that would be Aug. 21 2017. As associated with transitional sequence, I suggest there are periods of significant cosmic ray fluctuation. This process would be in addition and co-occurring with periods of rapid temperature flux closest to the apex event. In a coming article, I will explain the causal effects mostly related to geo-physical occurrences, which I expect to begin next week. Watch for my reports as they occur. In this article my focus remains on charged particles effect on humans and how this could be the basis for a presumed connection to civil unrest and war. To best convey the connection between cosmic rays and humans is to present how medical procedures are being used today to treat an assortment of mental health diagnosis such as depression, ADD, bi-polar, anxiety, and ptsd. It has also been effective for dementia and other memory problems like concussions and (TBI) traumatic brain injury often associated with combat veterans from explosives. 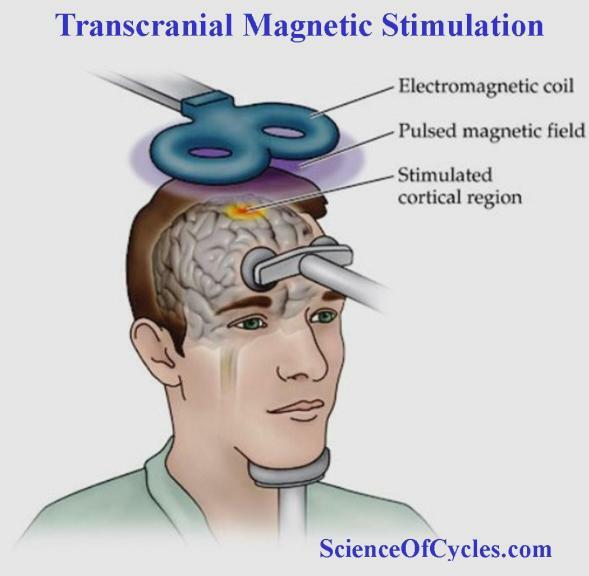 Transcranial Magnetic Stimulation (TMS) involves the use of a magnetic coil which produces a magnetic field and placing it against the scalp. Capacitors from the TMS machine pass electrical currents through the coils that create brief, pulsating magnetic fields that pass through the skull and create electric currents in the neurons or nerve cells of the brain. Charged particles created by the electromagnetic field releases natural brain chemistry in neurons and synaptic receptors. The choice of stimulation parameters determines whether the effects of stimulation are excitatory or inhibitory. For example, two single pulses separated by less than 5 milliseconds can produce intracortical inhibition, while two single pulses separated by a gap greater than 10 and less than 30 milliseconds can produce intracortical facilitation. This accounts for the reason some people may experience feelings of increased energy, hyperactive, or anxious during the duration of a powerful CME (coronal mass ejection) or large X-class solar flare – while others express feelings of depression, lethargy, or disoriented. I hope this best explains how the fluctuation of charged particles in the way of cosmic rays (and solar rays) can have a direct causal effect on humans. Furthermore, how the expansion and contraction of charged particles influenced by a full solar eclipse can set a template of for civil unrest and war motivated by fear and disorientation. Coming Next: How the same fluctuation of charged particles that can elicit human emotional discord, can produce a discord of its own with Earth in the way of tectonic shift and mantle plume instability giving way to dramatic earth changing events.